Plays 26 minutes, scores Milan's only goal, named MOTM by some. We'll miss him dearly until he heals. One good thing was that Milan broke their three match cycle and came out to play, no more sleeping in the first half. 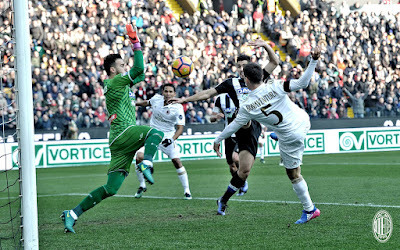 In fact, in the eighth minute, Bonaventura scored an incredible goal from the perfect Suso assist. 1-0 Milan. Milan were playing fierce, and Udinese were being given very few opportunities. Then came the injuries. 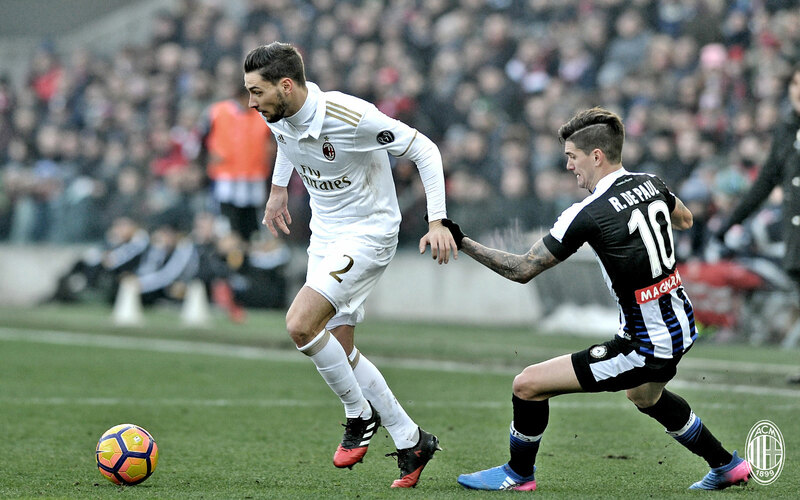 In the 22nd, Bonaventura seemed to have maybe pulled a muscle. He tried to continue, but was subbed off for Deulofeu four minutes later. 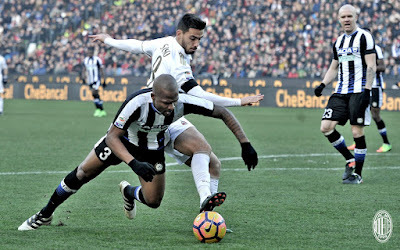 Udinese lost Faraoni to injury as well, who was subbed off in the 30th. In the 31st we saw the dangers of playing a 19 year old as a regista. For the second game in a row. Locatelli made an error. He gave the ball away, and it was just a matter of a couple of passes before Thereau kicked it past Donnarumma for the equalizer. 1-1 all. For those of you who criticized Locatelli and or Donnarumma last week, I don’t even know what to say. How can you say stuff like that online about a literal child? And a 19 year-old? You begged for this youth movement and then you say stuff like that? Whatever you may think their mistakes were, you showed many, many, many times greater mistakes as a human being. Disgusting. Please don’t call yourself a Milan fan anymore. Secondly, would you rather have a washed up, whiny 32 year-old make those mistakes every single week, singlehandedly pulling the mentality of the team down to his level? Or would you rather have a promising 19 year-old make a couple of mistakes every now and then, learn from them (like we talked about on the last podcast,) and grow and improve? If it’s the first, don’t worry, I think Montolivo is getting closer to coming back, because he tweeted about tennis today, but not Milan, like the fine captain that he is. If you are sane, and know anything at all, you’ll be patient with Locatelli. He’s got Pirlo’s shoes plus six agonizing years of pain at that position to fill. It would take anyone a while to fill them, if it’s even possible. Give him time. Now where was I? Ooh… Paletta had at least a couple of breathtaking interceptions, as well as defending like a rock. Literally when he and Romagnoli are together, I don’t even think about the defense. 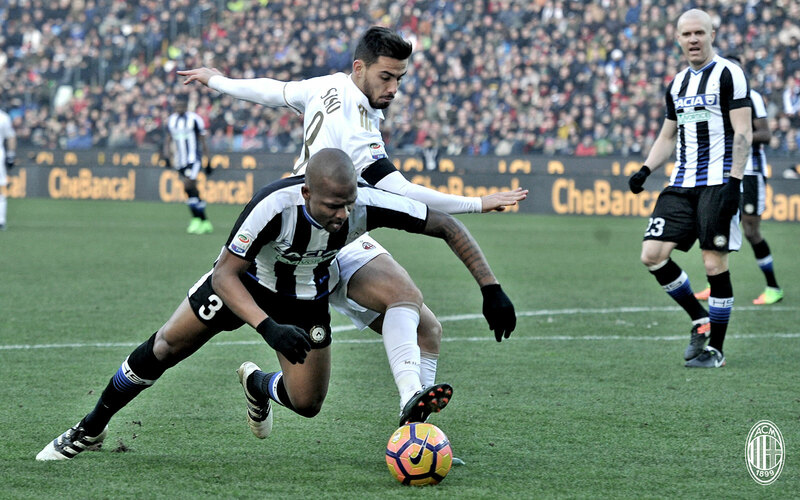 Udinese were troubling us more with counters as the half progressed, but somehow, we kept Karnezis busy, too. Banti finally showed a yellow (several opportunities too late) to Pasalic in the final minute of stoppage time. Poor kid was trying to muscle Fofana, and Fofana just embarrassed him, with the yellow card on top of getting owned. Suso is priceless. Absolutely priceless. The second half started with a bang – to Donnarumma’s face. He got a nasty bump on his forehead thanks to the other Zapata, but the kid just got back up and did his thing. That kid is amazing. And to anyone who thinks he should do better, I’D LIKE TO SEE YOU DO BETTER, YOU UNGRATEFUL CRETIN. (puts mom voice away.) We had some great chances… it was nice to see Deulofeu & his buddy Suso link up, Bacca had a shot that Karnezis just barely deflected, and then Suso’s free kick in the 63rd forced a great save by Karnezis as well. The controversy came in the 71st when De Paul, after the ball was long gone, went in to De Sciglio’s ankle studs up from behind. That is always a red. Always. And De Sciglio’s pain was palpable as we watched in horror as Banti could barely be bothered to give De Paul a yellow. A yellow? Seriously? That clip will literally be used to train future refs as to what constitutes a red card. It was textbook red. It’s why red cards exist. But De Paul was only given a yellow, and De Sciglio was lucky to hobble off the pitch. Early reports say it was a bad sprain, but later reports said they think it is a fracture and he is out for the season. Heal up, Mattia! Now for the big controversy: De Paul scored the winning goal just two minutes later. You know, the guy who should have been sent off and would miss at least the next match after he tried to end De Sciglio’s career? So it was 2-1 in the 73rd. And it shouldn’t have been. At least not from him. And Udinese would have been on ten men, too. Instead, Milan were on 10 men because of De Sciglio's injury. So wrong. One right call and it all would have been different. In the meantime, Montella had subbed Lapadula off for Bacca before the goal, and Vangioni came on for the maimed De Sciglio right after the goal. This is another pet peeve of mine: Montella’s subs. They are almost always too little, too late. I can count on one hand all of the times this season where even one of his subs made an impact, either in timing or need or both. And Lapadula worked hard, but he was too little, too late. Vangioni… I keep having to look at the website to remember he’s even ours. Or what he was supposed to have done or why we waited to get him in the first place. He certainly made zero impact today, while Antonelli stayed on the bench. Why? No, your subs don't make any sense at all. Please do better. 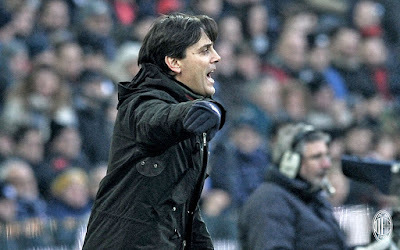 The match continued, and Milan ran out of steam as the second half wore on. Which is backwards as to what it’s been. But shows they mentally just don’t have 90 minutes in them. Or maybe they would if ref calls didn’t impact the game. Who knows? Banti only gave five yellows in a game that was very, very physical. If I had a nickel for every time he waved “play on” instead of whistled a foul or cautioned someone, I could afford to live in a country where I can actually watch football instead of searching in vain for streams that my country blocks at six in the morning. That’s right, this match hurt in a lot of ways. But the final play was Donnarumma’s breathtaking one on one save on Duvan Zapata, the one who had kicked him in the head earlier. You can kick him in the face, but he’ll be damned before you score on him. 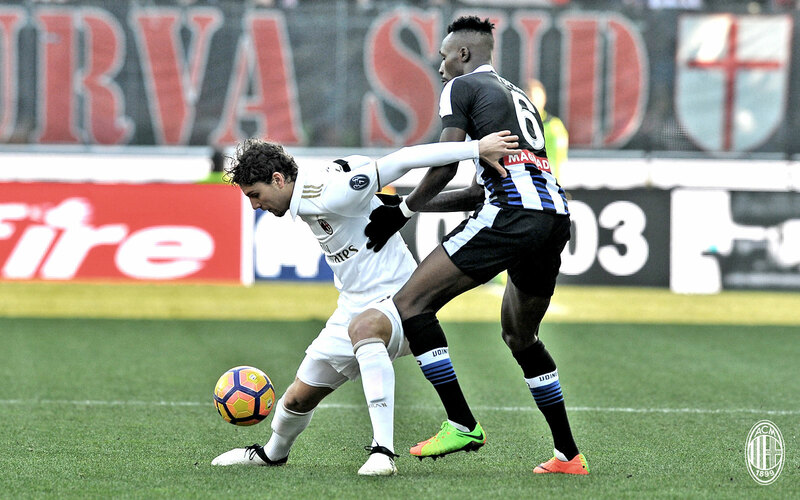 It was like one big long painful full circle for Milan fans, and an exciting win for Udinese fans in their beautiful sold out Dacia Arena. To credit Udinese, their players deserved to win. Except for that Neanderthal De Paul, who was bragging afterwards about the goal that should have never been and saying that he only deserved a yellow for his horrifying tackle on De Sciglio. Shut up. Karma hurts, you know. And a sincere apology and some humility would suit you well in this circumstance. Pasalic is fast and dynamic, but he's really small and easily manhandled. It wasn’t the worst loss ever, and like I said, at least we started strong once again. But we face a jubilant Sampdoria for the lunchtime game next week, who beat Roma today. And we’ll undoubtedly do it without Bonaventura and De Sciglio. So this game was the game that keeps on giving pain. And with the mercato closing Tuesday, Galliani gifting players we paid too much for away, then downgrading from Niang to Ocampos (who is scheduled to take his Milan medical tomorrow)… well things simply aren’t looking half as bright as they were in the first half of the season now, are they? You know since the last time they beat us? Ouch.